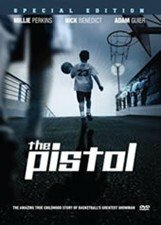 Inspiring true story of "Pistol" Pete Maravich, focusing on the basketball hall of famer's teenage years and the support given him by his father, Press Maravich. A wonderful, family-oriented sports drama, in the tradition of "Hoosiers." Adam Guier, Nick Benedict, Millie Perkins star. Special edition also includes the featurette "Inside the Heart of a Champion," featuring footage of Maravich giving his testimony, and much more; 104 min. Widescreen (Enhanced); Soundtracks: English Dolby Digital 5.1, Spanish Dolby Digital 5.1; Subtitles: English; audio commentary; "making of" documentary; featurettes; photo gallery.